Soundscape VR premiered the world’s first virtual reality music stage stage at the Suwannee Hulaween Music Festival on October 26-28th, 2018. Following a successful installation at Burning Man, Soundscape VR, created by Groove Science Studios, Inc., brought their state-of-the-art VR music experience to Florida and dazzled festival goers as they stepped into a surreal interactive and explorable virtual universe of music and light. Live music was played into the audio-reactive VR worlds and over the stage PA system simultaneously, while players created the visual experience for spectators via 120” projection screens. Across three days of the festival, thousands of Hulaween attendees had the opportunity to experience the first-of-its-kind virtual reality activation. 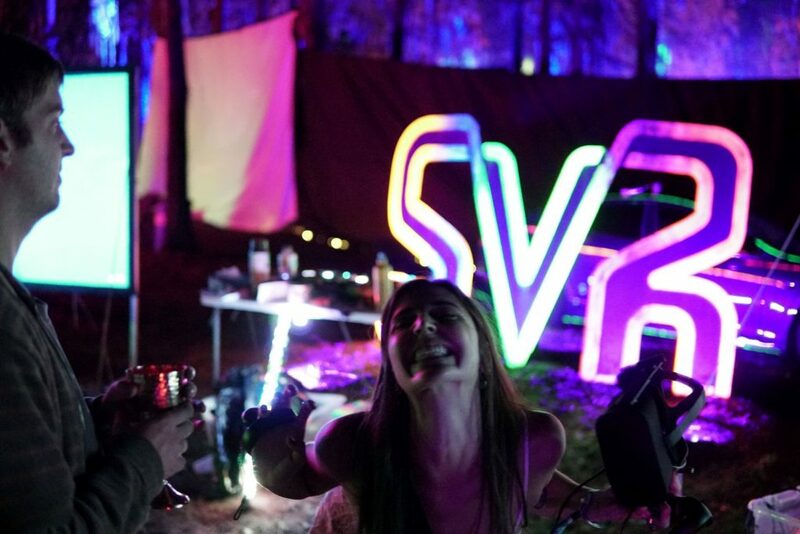 Consistent lines of people waiting for the chance to enter the Soundscape VR world were a regular sight; dancing, laughing, and enjoying the community of other festival-goers as they cheered on their friends manifestations projected across the big screen. Each player seemed to take a different path in exploring the world, with many finally taking off the headset only to immediately return to the back of the line for another round. As the rhythm of the bass sent waves of light rushing through the virtual world, players took flight to explore their new realties; blasting fireworks, painting, and doodling names in the sky. One world would exist deep inside a shifting nebula of infinite scale, the next on a icy peak bathed in the glow of the aurora borealis. As one player created a cyclone of embers inside a crystalline cave, the next would spray a firehose of light, bombarding a distant planet. Watch the Soundscape VR Hulaween aftermovie to see the installation in action here. Photos of the experience are available here. Soundscape VR started in 2013 as a vision of a new way to bring people closer to their favorite music, empowering artists and users alike. The company would later unveil the world’s first VR music venue at Burning Man, becoming one of the most immersive art experiences at the illustrious event. The software continued to advance as the company grew, now launching it’s festival tour where fans engage in a audiovisual sonic-adventure synchronized between two realities; a fantasy world of light and sound beyond their wildest dreams. PricewaterhouseCoopers estimates that virtual reality will generate $4.9 billion in revenue in 2018, up from $421 million in 2016, and it’s set to expand the most of any entertainment industry, with 68 million headsets in use by 2021. Soundscape VR is preparing for that growth by expanding past singular consumer use and has added capability for musicians and production companies to use Soundscape VR as a medium to perform in the real and virtual world simultaneously through synchronized performances. On December 20th, Groove Science Studios will be launching a free expansion to Soundscape VR adding private & public social VR worlds, a new multiplayer rhythm game, a redesigned interface, as well as a suite of other enhancements.